Beer supplier Constellation Brands wanted a way to increase in-store visibility and boost sales for the Corona beer brand, so it turned to longtime promotional partner Bensussen, Deutsch & Associates, Inc. for a head-turning idea. Jay Deutsch, CEO and co-founder of BDA, Inc., shares how the Woodinville, Washington-based distributor applied its expertise in bobblehead promotions to turn heads in the marketplace. PPB When Constellation approached BDA, what were their goals for the program? Constellation has been a client of BDA for years, so when they decided they wanted to increase Corona beer sales during football season, they turned to BDA to create a promotion to gain floor space in stores and ultimately increase beer sales. The only limitation was the fact that the promotion had to be within a budget of $200 per bobblehead. PPB How did you come to select Jon Gruden and bobbleheads as the focal point of your product development? What was the process like for obtaining permission to use his likeness, and where were the bobbleheads produced? 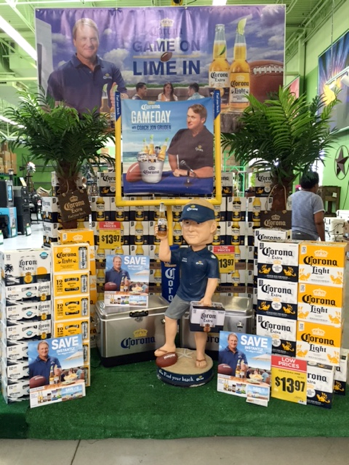 Deutsch [Former pro football coach and current ESPN analyst] Jon Gruden is the current spokesperson for Corona, so it seemed only fitting to use him for this promotion. Once we decided we wanted to involve his likeness, we worked with the Corona brand team to get his approvals. BDA is the largest producer of bobbleheads and we were on track to produce 3.8 million bobbles last year. However, this is the first time we created a four-foot bobblehead for in-store promotion which makes it so exciting for consumers. The bobbleheads were distributed to nearly 4,500 stores nationwide. Now, here’s the really cool thing our team did. It typically costs up to $350 to ship one of the Gruden bobbles across the country. But by managing the distribution ourselves, our team sent product to seven different distribution points bringing shipping costs down to $55 per unit. PPB How long did the development of the promotion take, from initial meeting to delivery of product? How long did the promotion run in stores? Deutsch The initial proof of the concept was created in May 2015 and then we showed a sample of the physical product at the national Gold Network Summit (GNS) in March 2016. And, as they say, the crowd went wild. As soon as Constellation gave the green light on the promotion we went into production from March to June and the first deliveries were made in July and early August. BDA has offices in China that allow us to work directly with a factory for some custom projects. The promotion ran in stores for 30 to 60 days. The biggest lesson we learned from this project is that we must plan ahead. Even with a six-month lead time, we maxed out production on nearly 4,500 four-foot units and 15,000 seven-inch units. PPB Beer seems to sell itself pretty well during football season, so how did the bobblehead promotion affect Constellation’s sales? Deutsch Beer is a crowded category, and the success of this promotion brings attention to the Corona brand during football season. This promotion was all about gaining share of eyes and having something in a unique place with creative displays. The never-before-seen, four-foot Gruden bobblehead also generated a lot of organic social media buzz. Corona was successful in driving nearly 4,500 new placements this season. Original published in PPB Magazine, PPAI Publications.